Halo Style rings have been around since the early Era's of jewelry design. 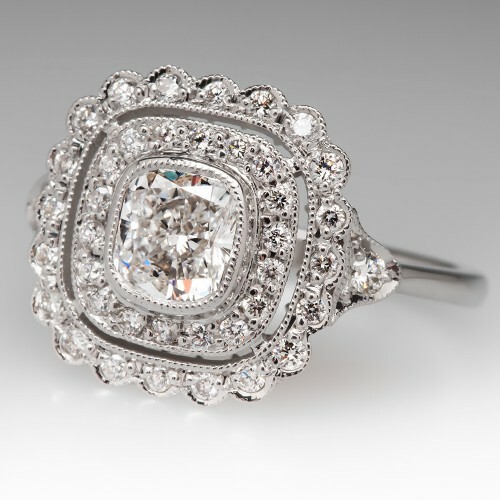 Halo settings are among the most popular in vintage engagement rings this season. Classic halo rings feature a central round diamond (or gemstone) surrounded by a circle (halo) of smaller accent diamonds. 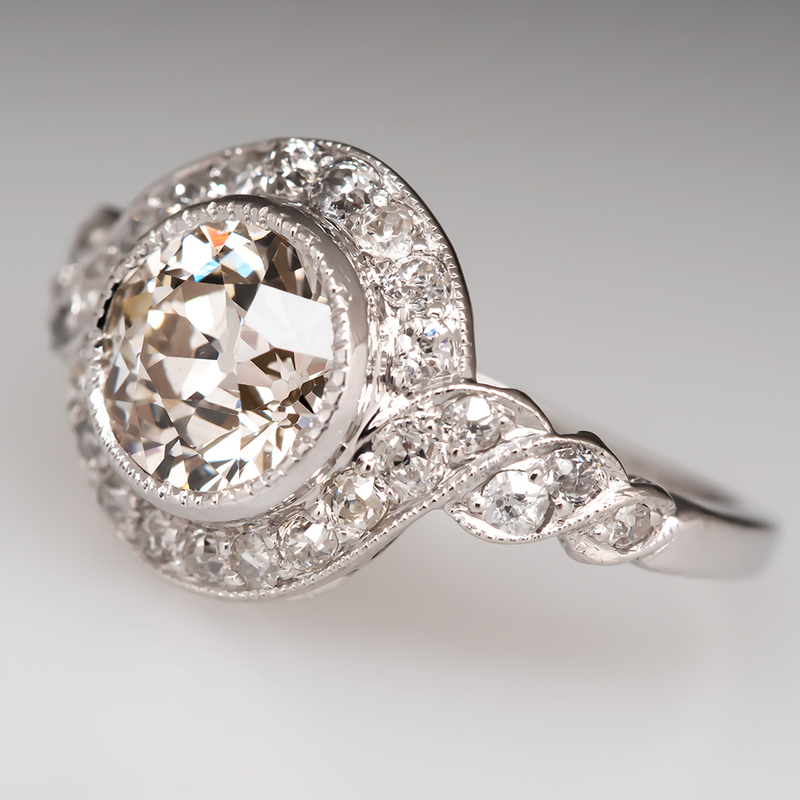 This setting finds its origins in the diamond surrounds so popular in the Georgian and Victorian Eras. During the Georgian Era, many rings were set with a central stone surrounded by smaller round diamonds or sometimes pearls. These central stones were either round or cushion-cut, and the diamonds surrounding it were not the micro diamonds we're used to seeing in today's halo settings. Rather, they were slightly smaller round diamonds which gave the appearance of an opulent picture frame. During the Victorian Era, this style continued with some modifications. Seed pearls and small round diamonds were still used to surround central gemstones. 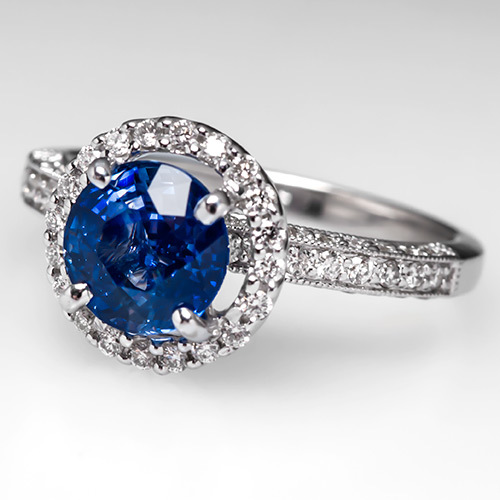 However, the central stones were as likely to be cabochon sapphires, chrysoberyls, blue sapphires, rubies, or turquoise. These central stones were often larger than Georgian Era stones, and the surrounding metal was often ornamented with filigree or millegrain. As the Victorian Era gave way to the Aesthetic Period, there is a marked return to the simplicity of the Georgian Era with a little more decorative effect. Ring bands became more substantial and included more symbolism. There are few examples of true halo settings during this period, although ornate surrounds were still being made in small numbers. Overlapping with the Aesthetic Period, the Art Nouveau Movement saw a return of colored central semi-precious stones. The surrounds became less architectural and more organic, flowing in an artistry reminiscent of foliage and flowers. These ornate settings were as likely to be pure metal as they were to contain smaller stones. It is arguable that what we now know of as the halo ring setting was not really in fashion during the Aesthetic and Art Nouveua periods. However, the practice of surrounding a central stone with a frame-like setting was perhaps even more in vogue during this time. 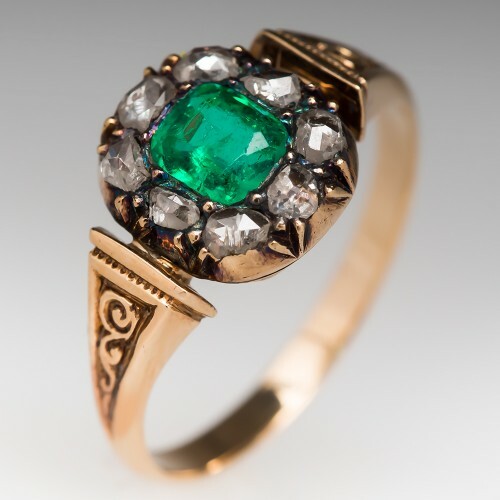 As the Edwardian Era dawned, the colored stones so popular during the Art Nouveau Period were seen far less. Platinum and diamonds became the norm, and designers continued to design pure metal surrounds, though the use of small diamonds resumed in measure. Pearls had fallen out of fashion for rings, and north-to-south styles began to emerge in force. These elongated settings continued to feature larger central stones (sometimes three in a row), surrounded by smaller stones set in elaborate architectural settings. It is during the following period, the Art Deco Era, that we see the emergence of what is classically referred to as the halo setting. The movement included an emphasis on symmetry and geometric patterns, making the concentric circles of halo settings extremely attractive to the aesthetics of Art Deco. Streamlined designs are the hallmark of Art Deco rings, and we see a marked decrease in elaborate settings for halo rings. The opulence and geometric shapes of the Art Deco movement faded briefly as the effects of the Great Depression settled over America. However, the Hollywood Glamour of the 1930s and 1940s emerged swiftly out of the ashes, and with it came a resurgence of large colored stones. In a type of synthesis of the previous century, these stunning rings seem to contain features from the Georgian Era, the Edwardian Era, and the Art Deco Era. The period spawned many rings with elaborate surrounds, which included slightly larger surrounding stones reminiscent of the Georgian and Victorian Eras. However, the classic halo seen first during the Art Deco period were scarce. As the 1950s dawned, we see once again a return to the more genteel. We also see an emergence of more square-shaped mounts, even for round diamonds. North-to-south arrangements gave way to more east-to-west settings, and round accent stones gave way to the flashy brilliance of baguette diamonds set in large showy displays around a central stone. These magnificent rings suggest stylized showy flowers. These cocktail rings were rarely considered suitable for engagement rings, so the halo style appears to have fallen out of favor for bridal wear during this period. 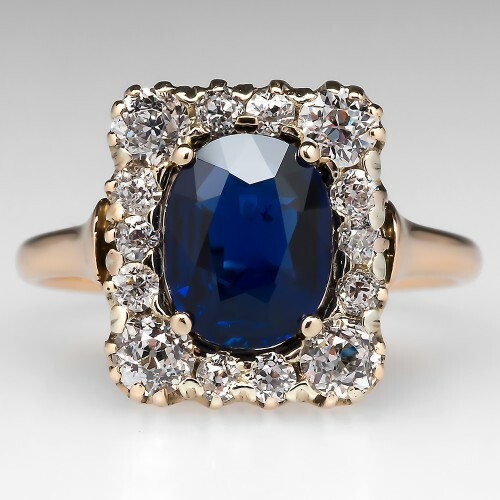 The 1960s and 1970s saw an increase in these bold statement rings, bringing them more into the engagement ring market. Floral designs returned to more organic shapes, and with this return we see an increasing number of rings with a central round stone surrounded by smaller round stones reminiscent of a daisy flower. There is a bit of an anything-goes attitude toward ring styles which seems to carry well into the 1970s. Very few classic halo styles are seen throughout the 1970s, 1980s, and 1990s. However, once again, the practice of framing central stones never really disappears. Today, classic halos have returned in force, expanding to include square-cut stones surrounded by pave-diamonds, reminiscent of the architectural designs of the Art Deco movement, as well as the brand new double-halo style that is growing in popularity today. The re-emergence of halo engagement rings may appear to be a new trend, here today and gone tomorrow. However, it is clear by history that the practice of surrounding a larger stone with smaller ones has never really disappeared completely. If you love the halo setting, you are certainly not alone in the annals of history! Halo Engagement Rings. "The History of the Halo Engagement Ring." Accessed January 29, 2014. http://www.halo-engagement-rings.net/the-history-of-the-halo-engagement-ring/. Macklowe Gallery. "Jewelry Periods." Accessed January 29, 2014. http://www.macklowegallery.com/education.asp/art+nouveau/Art+and+Jewelry+Terms/antiques/Jewelry+Periods.